CLEVELAND (AP) — LeBron James was jolted forward when the massive crowd swelled from the sidewalks and into Cleveland’s streets, surrounding the convertible that he and his family were riding in. This wasn’t supposed to happen. James looked at his wife, Savannah, their baby daughter and two sons and feared for their safety. “We were kind of afraid for a second,” James said. Scanning the crowd, James spotted people dangling from lamp posts and traffic lights, even a few straddling window ledges to get a glimpse of the champion Cavaliers, who were being honored with a once-in-a-generation downtown parade after their comeback in the NBA Finals. James was awe-struck, and any concerns quickly melted away when he looked at the spectators’ faces and saw only smiles, laughter and tears of joy. And he had made it possible. James, who ended 52 years of sports heartache by bringing Cleveland a championship and used his superstar platform to address social causes, was chosen as The Associated Press 2016 Male Athlete of the Year, an award he won previously in 2013. Results of the vote by 59 editors from AP member newspapers and customers were announced Tuesday. James collected 24 first-place votes, beating out a pair of Olympic legends: Michael Phelps (16) and Usain Bolt (9), the fastest men in water and on land who are not accustomed to finishing behind anyone. Chicago Cubs third baseman Kris Bryant, the NL MVP who led his team to its first World Series title since 1908, tied for fourth with Golden State star guard Stephen Curry, last year’s winner. Cristiano Ronaldo, Von Miller and Andy Murray also received votes. James joined Michael Jordan as the only NBA players to win twice. Jordan won it three straight years from 1991-94. U.S. Olympic gymnast Simone Biles was named AP’s top female athlete on Monday. A rabid sports fan, James was flattered to be in the same class with Phelps, the 23-time gold medalist who added five more to his record collection at the Rio Olympics. That James received the honor in an Olympic year underscores the weight of his accomplishments. 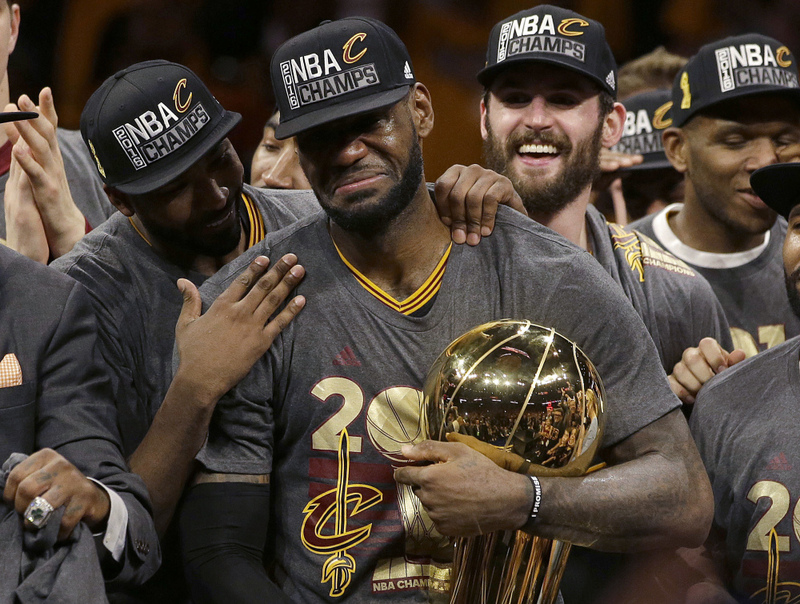 His third NBA crown was for Cleveland, delivering on a promise James made to a city that hadn’t celebrated a major championship since 1964 and had endured many torturous sports moments since. James, whose game shows no signs of aging as he approaches his 32nd birthday in a few days, came up short in 2015, leading an injury-depleted Cleveland team to the finals where they lost to the Warriors. And although James posted the best statistical series of any player in history, his critics were quick to point out his 2-4 record in the finals compared to Jordan’s 6-0. The Cavs got a rematch with the record-setting, 73-win Warriors. Led by Curry, the league’s unanimous MVP choice, Golden State was being talked about as potentially the best team ever, an argument that gained steam when it took a 3-1 lead. James, though, wasn’t going to be denied again. He scored 41 points in Games 5 and 6 and posted a triple-double in an epic Game 7 that will be remembered for his chase-down block of Andre Iguodala in the closing minutes – a defensive gem that stands as the signature play of his magnificent career. James’ journey to his greatest triumph coincided with the passing of another great – the greatest of all – as Muhammad Ali died on June 4. During the playoffs, James watched tapes of Ali’s fights for motivation. It was in the spirit of the boxing legend and global ambassador that James stood on stage with close friends Dwyane Wade, Chris Paul and Carmelo Anthony at the ESPYs in July to decry violence against unarmed black men and encourage fellow athletes to do more to support local police and improve communities. James later donated $2.5 million for a Smithsonian exhibit honoring Ali, and he’s producing a documentary on the champ. “He’s definitely a person I’m inspired to be like, to have a social conscience about things,” James said. “What I always saw in Ali was that he was always educated about everything he was speaking about. He was never just talking to be talking. There was a method to the madness.